Published: October 2017 - Orion's Children's Books. Triggers/Content Advisory: Very mild fantasy violence. Source: Thank you so much to Pan Macmillan SA for sending me this book in exchange for an honest review. Enter the Wundrous world of Morrigan Crow and Nevermoor - the most fantastical children's release of the year.Morrigan Crow is cursed. Having been born on Eventide, the unluckiest day for any child to be born, she's blamed for all local misfortunes, from hailstorms to heart attacks - and, worst of all, the curse means that Morrigan is doomed to die at midnight on her eleventh birthday. But as Morrigan awaits her fate, a strange and remarkable man named Jupiter North appears. Chased by black-smoke hounds and shadowy hunters on horseback, he whisks her away into the safety of a secret, magical city called Nevermoor. It's then that Morrigan discovers Jupiter has chosen her to contend for a place in the city's most prestigious organisation: the Wundrous Society. In order to join, she must compete in four difficult and dangerous trials against hundreds of other children, each boasting an extraordinary talent that sets them apart - an extraordinary talent that Morrigan insists she does not have. To stay in the safety of Nevermoor for good, Morrigan will need to find a way to pass the tests - or she'll have to leave the city and confront her deadly fate once and for all. 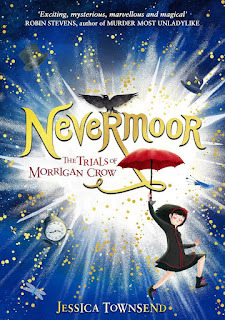 I think I first heard of Nevermoor when it was mentioned on Twitter, but apart from that I knew nothing about the book. I don't usually read MG, either. But this turned out to be one of those review books that I'm so grateful I was given the chance to read. I love the writing. It's simplistic and easy to read while at the same time never talking down to children - which is the age it's aimed at. The scenes are incredibly vivid, the descriptions beautiful and immersive, and the atmosphere is strong and colourful. Yes, the story has its similarities to Harry Potter, but it manages to stand on its own two feet and stay charming and fresh. It's lovely - with huge heart and energy. The dialogue is a real standout, too. It's deliciously hilarious and witty, and there are plenty of laugh-out-loud moments as well. The plot is strong. The pacing is perfect, and the action scenes and quieter moments are superbly interspersed. I loved every moment of this adventure. It is so imaginative and spellbinding, and the fun never stops. The climax, especially, is so satisfying. Townsend has incredible skill. The characters are compelling and vivid. Jupiter reminds me so much of the Eleventh Doctor (in Doctor Who) because of his personality (which is fantastically three dimensional, wacky, and lovable) and the secondary cast easily outshine Morrigan, the heroine. Everyone is so colourful and interesting, and I also adore the strong - platonic - friendships and relationships. They're excellent and healthy. The villain is also terrifying - perfectly so. His relationship with Morrigan is a bit too much like that of Voldemort and Harry's, but it still works. The only thing about the characters I feel is lacking is Morrigan. She's sweet and easy to root for, but her character needs more development and personality. She's too much of a stereotypical unloved little girl who wants to belong. In my opinion, it's the secondary cast who are better written. Nevermoor is a riveting debut sparkling with magic, imagination, and humour. The characters are rich, the plot never wavers, and it's a charming and well-developed adventure. 6 movies I'm looking forward to!